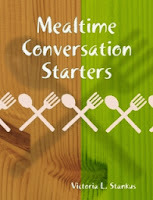 MEALTIME CONVERSATION STARTERS - Consists of 60 “topic cards” for you to print out and follow the simple assembly instructions. Have fun getting to know more about your family (or friends) while you spend quality time with them around the table. 10 THINGS I AM THANKFUL FOR - Printable document, meant to help remind you to be thankful. A MORNING PRAYER - Printable document, meant to help remind you to be an encouragement to others. YOU HAVE A PURPOSE - Printable document, meant to help you understand your purpose in this life.